The other day, I went to a friend’s birthday party and decided, along with her present, to give her some chocolate protein bars. She’s vegan, you see, and she’s always talking about how there’s no vegan protein bars out there that taste like ‘real food.’ She says they all have a weird aftertaste and stick to her teeth! So I figured to make her some really nice brownie-life protein POW bars! She loves brownies and all things chocolate so I went with pea protein and lots of cocoa. I added some freeze-fried berries on top too. Have you ever had those? They’re basically just berries, dehydrated until they become completely dry. And crrrrrrrunchy. Anyways, dehydrated berries are awesome to add on top (or inside) protein bars because they pack all the nutrients than fresh berries do but because they have none of the water, all they add is flavor. The first time I tried freeze-dried berries was years ago actually! In a clothes store in Brighton. The store sold all kinds of futuristic neon clothing and, in the middle of the room, they had a table full of ‘space food.’ Being ever curious about the idea, I bought a bag and then realized, hey-ho! These are just berries! In the last few years, freeze-dried fruit has popped up all over the place – gone from weird novelty to a healthy snack. Nowadays, you can find freeze-dried fruit in most supermarkets and health food shops. Get a bag if you see freeze-dried berries, or bananas even, near you. They’re awesome on top of bar, chocolates, and on top of breakfast cereal or yog! The only downside is they’re pretty expensive. But as a one-off thing, they’re cool to experience. Kids find them fascinating too! They have such an unusual texture and the whoel process of eating them – going from completely dry to wet in your mouth, well, that’s pretty fun. First, make your filling by simply combining all the filing ingredients together in a bowl until you get a smooth batter that you can shape with your hands into two rectangles (or balls). Taste the batter to ensure that it’s sweet enough for you and, if it isn’t, add more of the sweetener. Then, melt your chocolate and add a layer of peanuts +/- some freeze-dried berries on top! On top of that, I added a layer of peanuts and then some 90% dark chocolate (my friend likes dark stuff) and freeze dried berries! The result was these cute little bars which, I’m pleased to say, my friend absolutely loves so wooopa! Let me know your thoughts if you try them too! 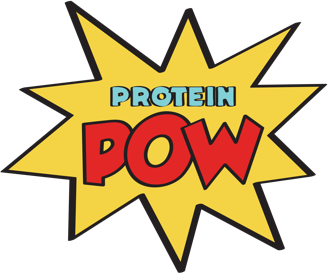 They’re a nice little bite of chocolatey protein karaka… POW!